Recently I implemented a brand new, very powerful server with solid state disks running Windows Server 2012 R2. But something shocking happened when I did: Every VM that I moved to that new server performed so poorly that users could not stand to use the machine. File transfers to or from the server were also taking an unacceptably long time to complete. 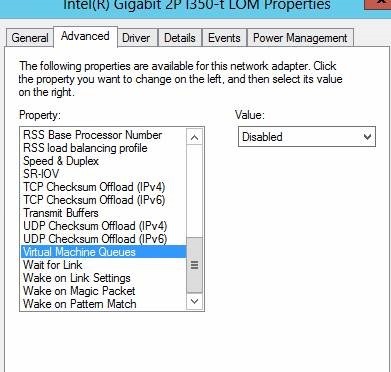 After some searching we figured out that the “Virtual Machine Queues” advanced driver option of the various network adapters in the server had defaulted to True. Changing these settings to Disabled instantly restored performance of the server back to normal / acceptable levels and user complaints instantly went away. 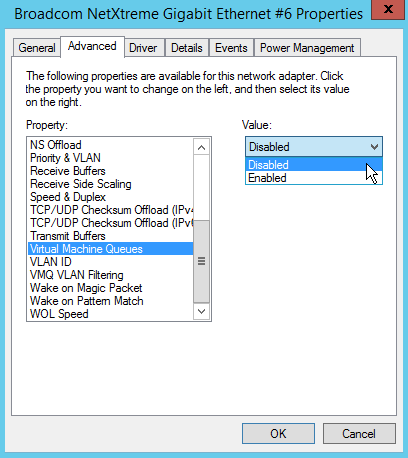 Right-click a network adapter and choose properties. Changing this setting for me at least made a dramatic improvement in network throughput and in Microsoft Hyper-V guest OS performance.